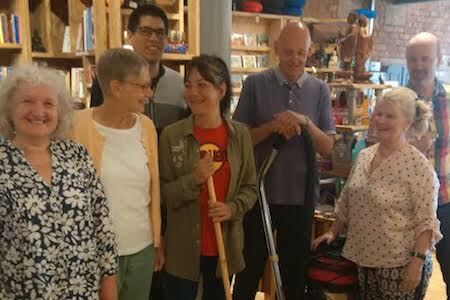 Work as spiritual practice – a weekly cleaning session for Centre regulars. You don’t need to come every week, and there’s no need to say you’re coming. If you’ve completed a Buddhism Foundation course, just turn up a few minutes before twelve. We’ll do some cleaning together and care for our beautiful shrine rooms, before attending lunchtime meditation or heading off for the rest of our day. We don’t employ any paid cleaners and need to share the work. Our Buddhist Centre was built by volunteers, working and practising together – let’s keep it going! Interested in volunteering at Manchester Buddhist Centre? If you have any queries about these sessions, or you would like to discuss other ways of volunteering at the Centre, then please contact Vidyapala on 0161 834 9232 or Vidyapala@manchesterbuddhistcentre.org.uk. Also speak to Vidyapala if you’d like to join in and are a regular at Tools for Living your Life or the led meditation sessions but haven’t completed a Buddhism course yet.